The Superliner I fleet was built in 1979 by Pullman Standard and were based on the famous Budd built Hi-Levels operated by the Santa Fe railroad for their "El Capitan" all-coach train. 102 Superliner I coaches were built, and 48 Superliner I coach-baggage combination cars with a secure baggage hold instead of lower-level seating. For transportation of bulk items, trains would run with cars known as "Material Handling Cars" cargo carrying freight cars which would run either on the nose or tail of a consist. The Superliner II fleet was introduced in 1990 as Amtrak's next generation of its now ubiquitous Superliners. 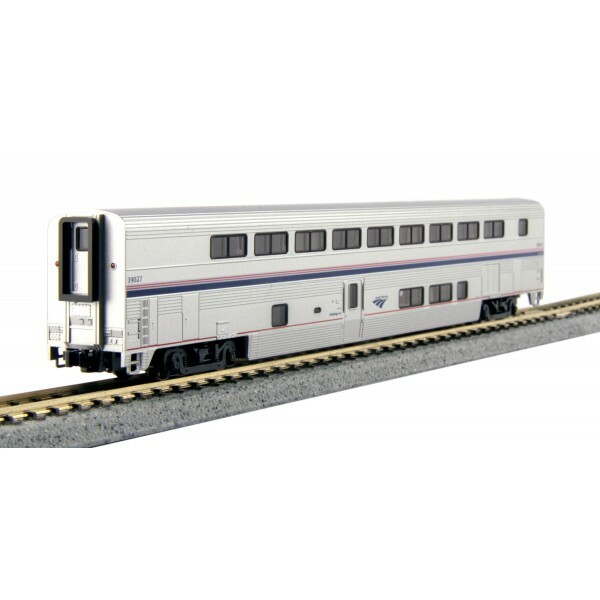 Visually very similar to their older cousins, the Superliner II's have a host of mechanical and electrical improvements to their design as well as construction. One of the new styles of car introduced with this new generation of cars was the "Transition Sleeper", or "Transition Dormitory" car. Intended to replace the aging High-Level Step Down cars, the Transition Sleeper fulfills a similar role by having high and low level diaphragms on either end of the car as well as having on-board crew accommodations. Budd Hi-Level Cars: The Budd-built Hi-Level cars had a great influence on Amtrak's passenger service, revolutionizing economy coach travel with their double-decker design. Even after the advent of the Superliner car, many of these Budd cars remained in service, in particular the "Step-Down" coach originally used to transition between single level and hi-level cars on the "El Capitan". These cars, along with de-skirted (for easier maintenance) Santa Fe Baggage cars, were a staple on all Superliner trains up to the introduction of the Superliner II car in 1990.